To be provided at event check-in. Ticket purchases are managed by Glendale Arts. Click HERE. Day of the event ticket purchases are available at the Alex Theatre Box Office (map) from 9:30 a.m. to 2:00 p.m.
To mark the tenth anniversary of Glendale’s first historic district overlay zone, The Glendale Historical Society is pleased to present its “Royal Revivals” Home Tour. 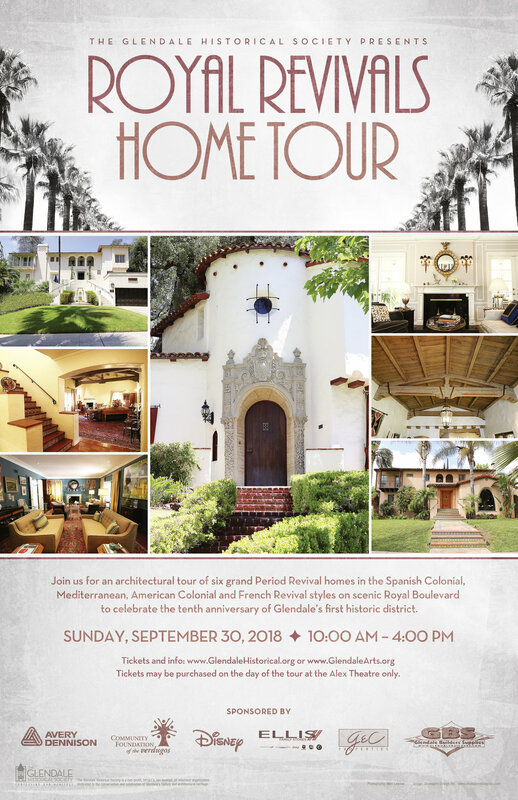 This year’s tour showcases six grand Period Revival homes in the Royal Boulevard Historic District. The homes were built between 1927 and 1936 and represent a variety of architectural styles, including Spanish Colonial, Colonial, French and Mediterranean Revival. The Royal Boulevard Historic District, which consists of 30 homes along a curving, palm-tree lined stretch on one of Glendale’s most scenic streets, was established in 2008 through a neighborhood-led effort. Today, Glendale has seven designated historic districts and three more working their way through the approval process. Lewis House, a beautifully restored 1927 Mediterranean Revival home with a dramatic horseshoe-shaped double staircase leading up to the entry. The house has a spectacular two-story entrance hall that features five arched galleries, reminiscent of an Italian villa with Spanish accents. Listed on the Glendale Register of Historic Resources, the house was once occupied by Ed “Strangler” Lewis, holder of numerous heavyweight wrestling world championships who later became a successful local restauranteur. Scoones House, a stunning 1928 Spanish Colonial Revival home with an imposing central tower and elaborate Churrigueresque style entrance. The home’s interior boasts many original details, including rustic exposed trusses with decorative straps and pegged connections, and beams with chamfered corners; stained-glass French doors; terra-cotta tile floors; decorative tile baseboards and staircase risers; and a vintage master bathroom with mottled tile and lily-pad motif on the ribbon border tile. Tupper House, a magnificent 1931 Spanish Colonial Revival home with an impressive two-tiered central entrance tower that includes decorative tiles around the upstairs window. The home’s façade is accented with an overhanging balcony of intricately carved wood, supported on large, carved wood corbels. The home’s interior contains many original features, including massive wood ceiling trusses, a quarter-round, radius-curved “beehive” fireplace with tile accents and stained glass windows. Jernegan House, a lovely 1931 Spanish Colonial Revival home with a one-story living room wing on the right with a half-arch buttress, balanced by the cantilevered second-floor balcony on the left, supported by elaborately carved joists and corbels with distinctive wrought-iron railings. The living room has a gorgeous Claycraft tile mantle that is original to the home. The house is listed on the Glendale Register of Historic Resources as an excellent example of the style. Daves-Cannon House, a striking 1936 Colonial Revival home designed by prominent Glendale architect Merrill W. Baird. The home is clad in brick at the first floor and wide-channel shiplap wood siding at the second, creating a strong horizontal emphasis and rich textural effect. The foyer features a grand winding staircase with oak treads, wainscoting, scrolled handrail and decorative carved stringers. The house, which introduces the use of traditional details in untraditional ways, is listed on the Glendale Register of Historic Resources as an outstanding and unusual example of the style; it was once owned by David Cannon, co-founder and president of radio station KIEV-AM, one of the only family-owned-and-operated radio stations in Southern California. McCall’s House, built as a model home by Rossmoyne Village, Inc. under the supervision of local architect Merrill W. Baird and featured as the “Home of the Month” in the September 1936 issue of McCall’s, the popular women’s magazine. In keeping with its French Revival style, the house resembles a country manor house with a steeply pitched hipped roof and decorative segmentally arched “eyebrow” dormers that interrupt the roof line at the exaggerated cornice. Lois Modglin, co-owner of Modglin’s Originals Los Angeles, a California art pottery company that operated in the 1940s, lived in the house from 1944 to 1955. The house is listed on the Glendale Register of Historic Resources. For more information, email events@glendalehistorical.org or 818-242-7447 or the Glendale Arts box office at 818-243-2611, ext 11. Guests will drive themselves to the featured neighborhood for docent-led tours of each home. The six homes are located within walking distance of each other. Some houses have stairs. Not all portions of the homes will be open for the tour. The tour will be held regardless of weather. Tickets are non-refundable.